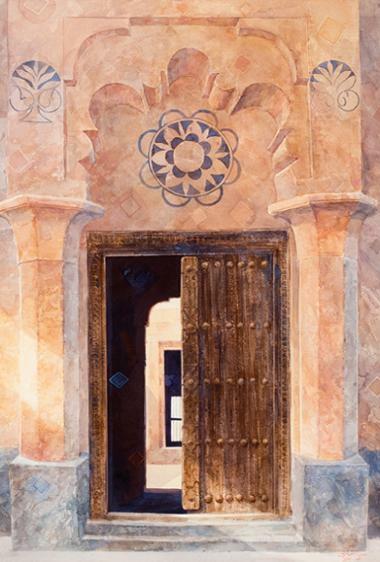 The door to Abdulqader Al Rais’ studio in Umm Al Sheif opens with a gentle push. The world inside is peaceful and understated. 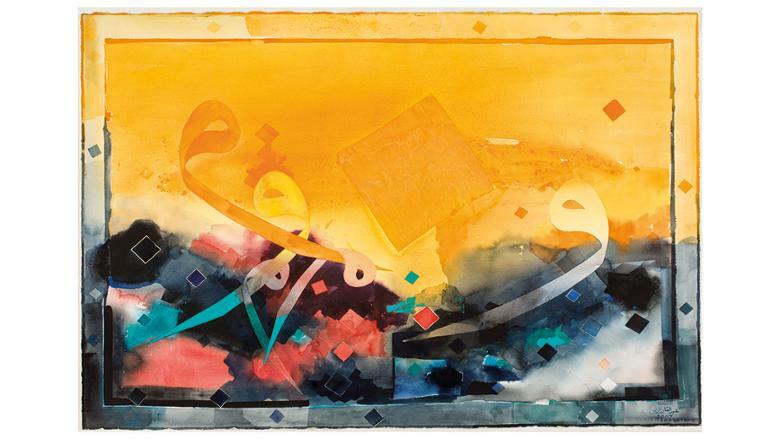 There are stacks of paintings everywhere – sweeping landscapes in water colour, old neighbourhoods of Dubai, traditional Emirati homes, wind towers captured in the mellow evening light, and abstract forms married with calligraphy that reflect the politics of our time. October has been busy for the artist. Al Rais is just back from Paris where Dubai Culture inaugurated his first international retrospective at the Institut du Monde Arabe (Arab World Institute) that was from September 25 to October 21. The exhibition displayed more than 50 of his artworks from the 1960s until today, covering various periods of his career, from his early years in Kuwait to his current life in Dubai, reflecting the pivotal role he has played in enriching the UAE’s cultural landscape. One of the greatest pioneers of contemporary art in the UAE, Al Rais’ work is found locally at the Cultural Foundation in Abu Dhabi and the Sharjah Art Museum, in addition to the beautiful murals at Etihad Museum and the Rashid Hall in Dubai Airport and the Dubai Metro. He is one of the five artists commissioned to produce a work of art on a train as part of the efforts of the Dubai government to encourage public art in Dubai. Internationally his work is hugely recognised and finds place at the British Museum, the Louvre in Paris, Northwest Museum of Culture and Arts in Washington, Museum of Contemporary Art in Shanghai, Museum of Modern Art in New Delhi and the Jordan National Museum of Fine Arts. 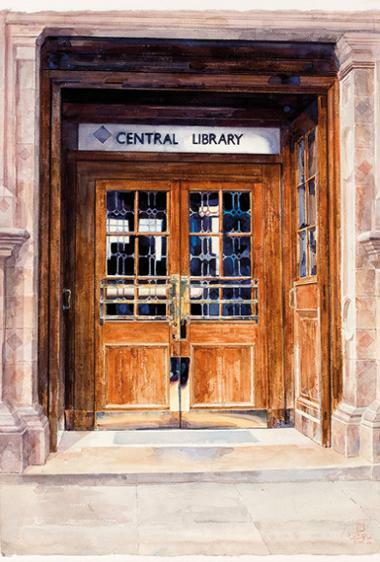 His work has also been displayed at the European headquarters of the United Nations in Geneva. Al Rais is, however, quite oblivious to the magnitude of this recognition. His studio (housed in his modest home where he lives with his family including son Musab and daughter Somaya, both artists in their own right) is as quiet and unassuming as he is. He doesn’t like to wax eloquent on his talent, neither is he vocal about his political ideologies. He lets his work do the talking most of the time, be it the nostalgia about a time gone by, or protesting the condition of refugees or simply expressing the need for peaceful dialogue in the region. A self-taught artist, Al Rais’ primary influences were largely the Dutch Masters and French Impressionists. Born in Dubai, he was sent to Kuwait when he was only 9. ‘I went to live in Kuwait with my sister and her husband after my father’s death. It was not very unusual in those days when a lot of Emiratis came to study and work in other Gulf countries such as Kuwait, Bahrain and Saudi Arabia,’ remembers Al Rais. During this time, the Israel-Palestine war of 1967, had a huge impact on Al Rais. It shaped his political ideology and strengthened his voice of protest through his art. The war left thousands homeless. Al Rais depicted this feeling in two of his most important works: Refugees and Al Intithar (The Wait) in 1968. The latter is an oil-on-board and has three Palestinian boys as its subject matter. The boys, with downcast eyes and slumped stances, done in muted colours, drive home the poignancy of the situation, which still holds true. The painting has not survived well in the desert climate and there are clear signs of damage that partially conceal one of the faces of the three boys. But it does well to document the artist’s political protest, as does The Refugees. 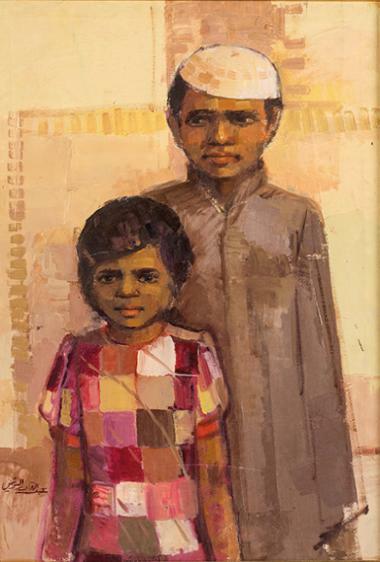 In 1971, another of his paintings, Amal, expressed his hope for a more peaceful world and a better life for all Palestinians, while in 1973 his work Obeid and Moza was about a boy and a girl in his neighbourhood in the Al Fahidi district of Dubai. These paintings from the sixties and seventies are particularly precious as they represent a body of work from Al Rais that no longer exist – figures that were sketched meticulously from real life. 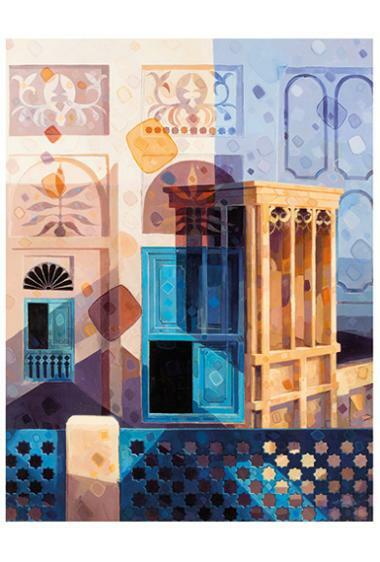 Back in Dubai after completing high school in Kuwait in 1973, Al Rais enrolled in college in Al Ain and had his first solo exhibition at the Al Ras Public Library in 1974 when he was 23. 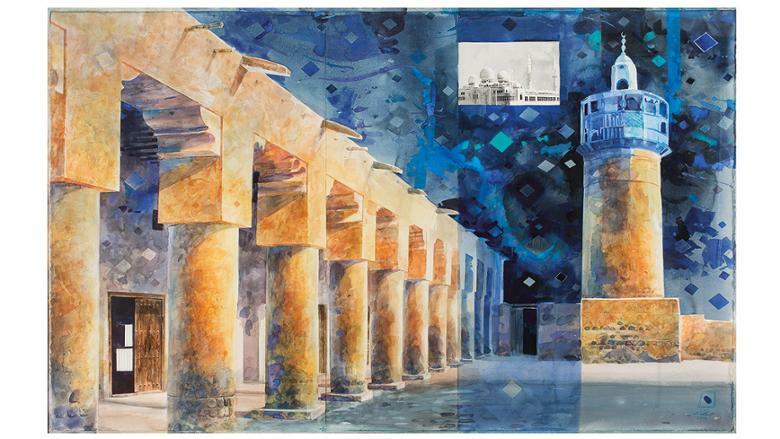 His works reflected his love for landscapes and traditional Emirati architecture, the coastlines and dhows going out to sea, and even a series of self-portraits. But soon he hit a block and stopped painting for 12 years. Throughout the eighties, nineties and much later as well, Al Rais has commented on the disturbed situation in the Arab world, be it the first Gulf War, the civil war in Lebanon, Palestinian refugee camps, the condition in Tunisia, Syria, Libya, and Yemen. In the Bourj el-Barajneh (1987), a single chained hand reaches up to escape the darkness of the Palestinian refugee camp in Lebanon; Aloghm Al Bahry (1992) protested the first Gulf War, Our Heart’s With You (1988) has the civil war in Lebanon as its theme; The Chair (2012) upon which sits a single pomegranate, has Al Rais carving names of the destroyed Syrian cities within the layers of paint; while We are with you (2015) is in memory of Emirati soldiers killed in the ongoing war in Yemen. ‘The whole situation in the Arab world worries me. People have suffered, been displaced and so many artists have become refugees. I see them in Europe, on the streets, selling their art for a pittance. It breaks my heart to see that,’ he says. 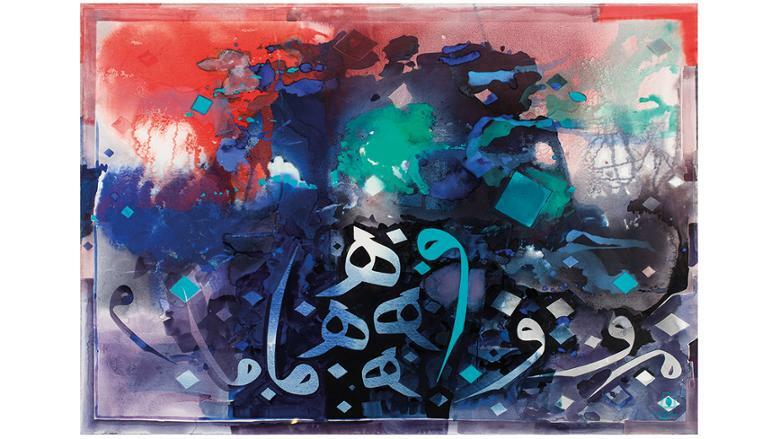 One of the best things Al Rais feels that has happened in the UAE now is the huge support for art and artists. ‘The UAE is such a diverse country and there’s a lot happening on the art scene, which wasn’t the case till the 90s. The emirates of Sharjah, Abu Dhabi and Dubai with their galleries, public art events and exhibitions, have made the UAE a global destination for culture, art and heritage. That’s something to be proud of,’ says Al Rais.